Programming AVR is easy with Atmel Studio. 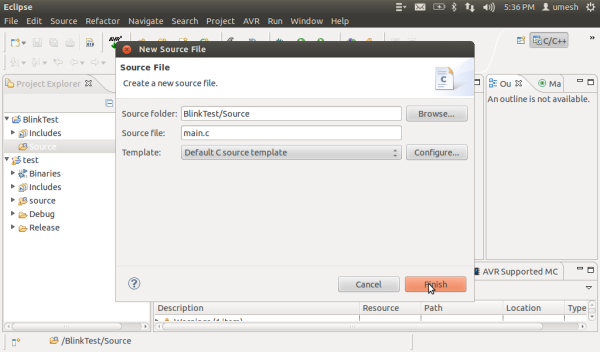 But same time moving to an Eclipse IDE (Integrated Development Environment) could be logical step. 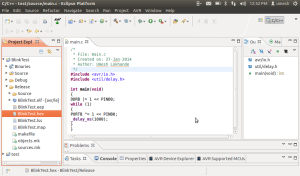 Eclipse has several advantages over Atmel’s provided tools. Eclipse is free IDE and you will be able to work easier and with range of tools inside the same program. Eclipse IDE is very efficient and provides great features for code reuse along with advance functions such as refactoring and code analysis. You can use Eclipse to develop software for Arduino, AVR, and ARM. These features make eclipse, programmers preferred choice to develop software for microcontrollers. 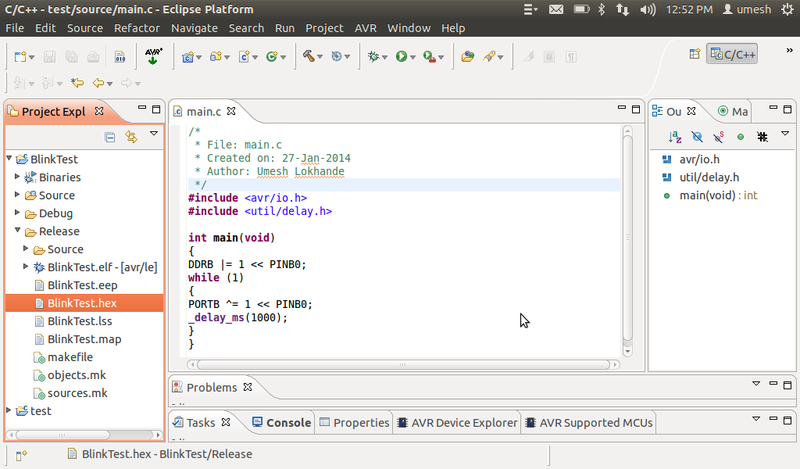 In this tutorial we’ll going to setup Eclipse under Linux for AVR Microcontrollers. This is step-by-step instruction guide. 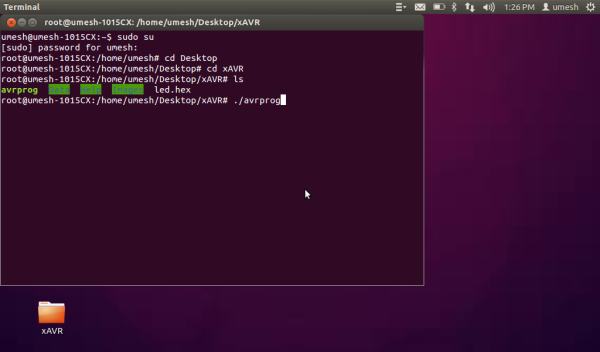 This entire process tested with Ubuntu distribution of Linux. Procedure remains the same with other distributions of Linux and Mac PCs. Once we open Eclipse then hit on, Help –> Install New Software… –> Insert link http://avr-eclipse.sourceforge.net/updatesite/ to work with box –> hit on Select All –> click on Next –> follow instructions until we get Finish button and hit on it. This is a step-by-step process to create fresh new project in Eclipse. After opening an Eclipse, make sure preferred location of your working directory i.e. workplace. Then hit on File –> New –> Project… –> C/C++ –> C Project –> then hit on Next –> give project name BlinkTest, make sure Project Type and Toolchains has been chosen properly as shown in figure –> hit on Next –> Next –> choose MCU Type in our case ATmega32 and MCU Frequency(Hz) 1000000 –> Finish. 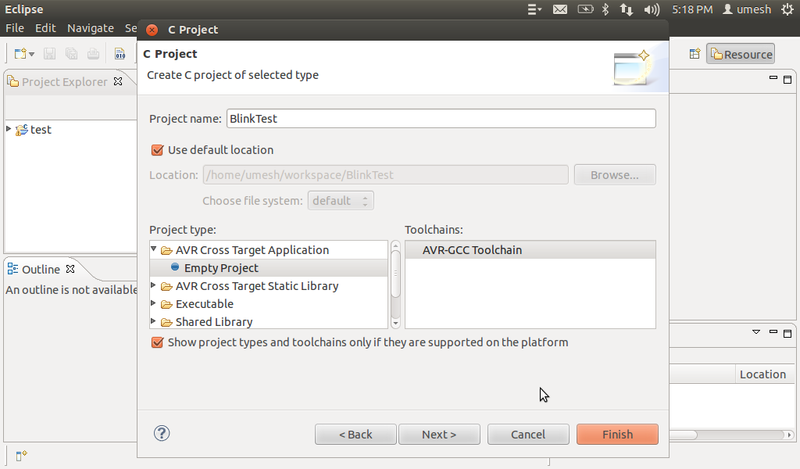 At this point we have successfully created new project called BlinkTest under Eclipse. Let’s add source file to write C code. 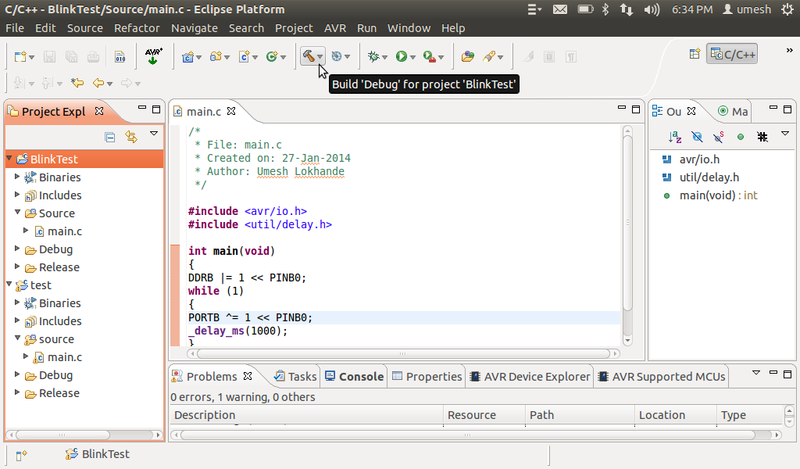 Now we have almost done everything to successfully develop software for your ATMEL AVR device in Eclipse. To build your project, simply click on the hammer in the tool bar or press Ctrl-B or Command-B. Eclipse will the compile your project and generate the necessary firmware files. Congratulation….!!! We have done with most of a part. Only thing left is to load this BlinkTest.hex file into microcontroller. Now we have to look at installation of eXtreme Burner. Finished! The rest is up to you. 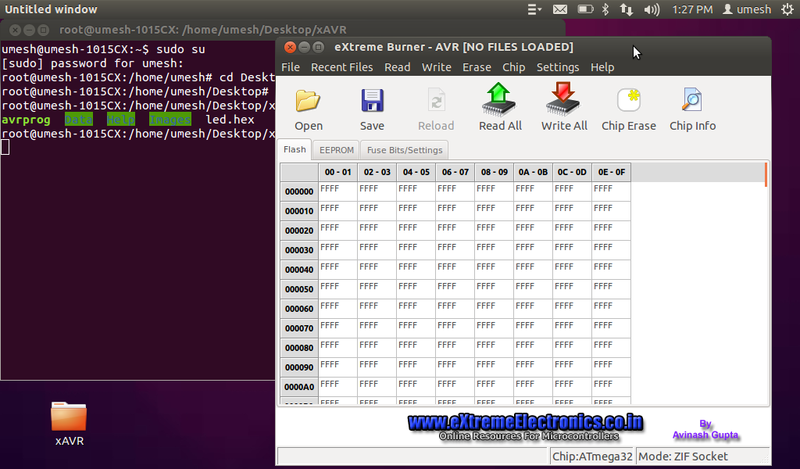 Now you got everything to develop AVR programs with all the comfort Eclipse offers.